When people asked me where I was going on a ski vacation, I would say “British Columbia.” The response would then be “oh, you’re going to Whistler” like it’s the only ski area in British Columbia. 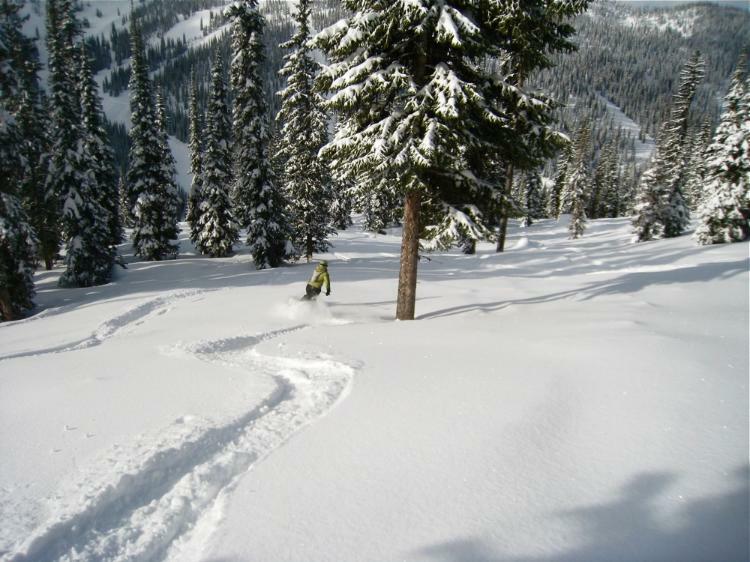 The fact is, there are more than two dozen ski resorts in British Columbia and the best-kept secret is that the Kootenay Rockies boast some of the most reliable dry powder conditions, and that it’s relatively undiscovered by most U.S. skiers. After a very long journey from three different upstate NY airports to Spokane, WA, six of us made our way across the Canadian border to Red Mountain, which is near Rossland, BC and made our headquarters at the Red Shutter Inn, home of Big Red Cats, and just a short walk to the lifts. We rented a rustic a-frame cabin for four people and two others stayed in a private room at the inn right next door. The Red Shutter is not luxurious or fancy. It is basic, warm, comfortable, and suitable for people who are there for the skiing and do not require fancy digs. There are definitely more modern and luxury accommodations on the mountain, but for our group, the Red Shutter fit the bill. They serve a breakfast to those staying at the Inn. There are only six bedrooms in the Inn, so breakfast is for at most 12 people. The cabin has a modest kitchen, which was ideal for preparing our own meals. Affordable on-mountain lodging is unheard of in the U.S., especially with a nice outdoor hot tub. Red Mountain Resort has a rich history of community effort originating with the miners who came for the gold rush in the 1800s from Scandinavia, bringing with them their skiing heritage and founding one of the oldest ski areas in Canada. Red Mountain is the smaller of the two mountains that make up the resort today and has approximately 1,500 feet of steep vertical and has one double chair lift. In 1896, the first downhill ski race was held from the top of of Red Mountain. Today, the racing tradition continues on Red Mountain.The adjacent larger mountain, Granite Mountain, is nearly 3,000 vertical feet of steep bowls and glades. The Paradise side of Granite offers some beautiful glades that are less steep as well as a lodge that can be a great place to stop for lunch. For something more challenging, “The Coolers” (Canadian for “couloirs”) are very steep chutes that are best when the snow is soft and deep. When the wind and ice fog limited visibility, we stuck to the powder-filled trees off Buffalo Ridge, The Powderfields, and The Slides. These areas did not disappoint and kept us most happily entertained.The lower reaches of these glades feel like a natural terrain park with dips and jumps and varied terrain features. When the wind and ice fog shut down the Motherlode Triple Chairlift, we found fresh powder over in Poochies and War Eagle on Red Mountain. It seemed that it was constantly snowing while we were there, except for the day we were leaving. The snow didn’t accumulate in inches, as much as it did in centimeters, but that’s because it was Canada. No super deep accumulations, but a constant refresh of already powdery surfaces. We did not encounter anything on the slopes that resembled ice or hardpack. It was all powder on powder. The downside was that the storm brought in a lot of wind and ice fog, which made visibility a big issue at the summits of both Red and Granite Mountains. The snow at the lower elevation was denser and heavier than at the top of the mountain. Red Mountain has a variety of natural features including cliffs. None of these features/hazards are marked and anyone who does not know the mountain can easily be lured by fresh powder to the ledge of a cliff. This happened to us. I was following Mark. First he said “once we get down this cliff, we’ll have lots of fresh powder.” Once he got through, he yelled up that his way was sketchy and that I shouldn’t follow him, but I should go left. I went left and the cliff got even taller. I kick-turned and came back, only much lower and closer to the cliff. The only way down from where I was meant threading my skis through some trees while hanging from a tree and lowering myself down the rock face. This was not ideal and I don’t recommend it to anyone. If you aren’t skiing with a local or a snow host, you are risking finding yourself in difficult circumstances. 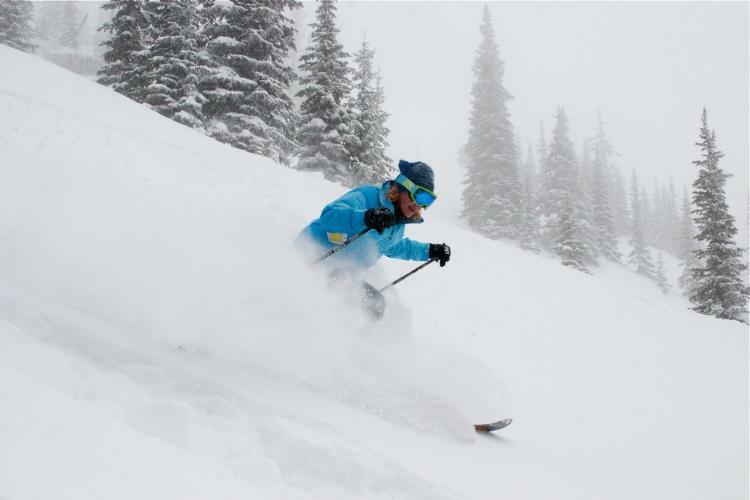 The free guided tours with Snow Hosts are a great idea for your first visit to Red Mountain Resort. As if our first day at Red Mountain didn’t provide us with enough fresh powder, we were scheduled to go cat skiing on our second day. 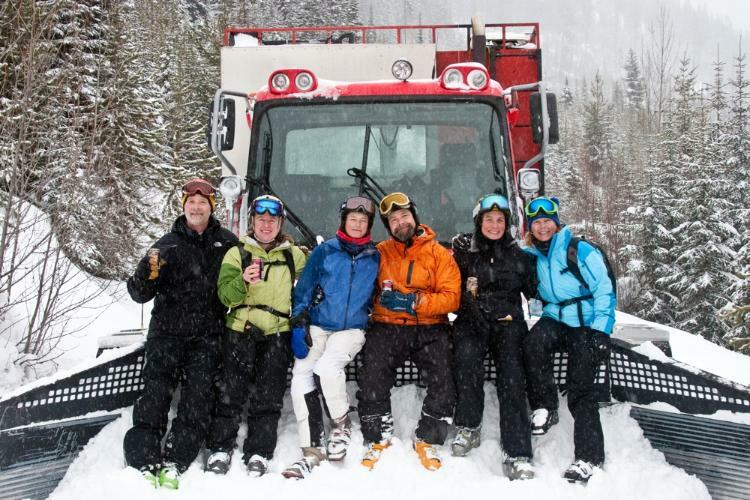 Big Red Cats provides a back-country experience with untracked snow for all ability levels. 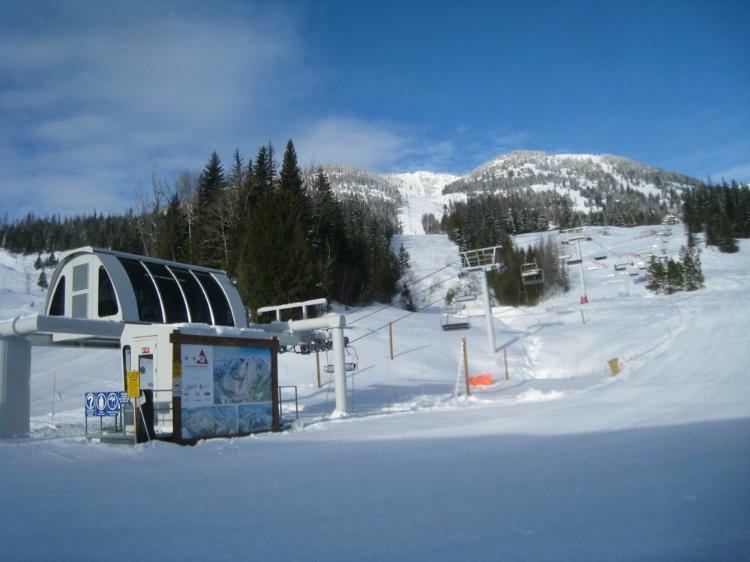 Their terrain is as big as Vail and is comprised of five mountains in the Rossland Range. Avalanche danger was considerable the day we were there, so we were limited to low angle slopes, though we did get some turns in steeper trees. Our guide, Corey, with utmost professionalism, gave us clear instructions before each run on what to expect and how to approach it. The runs were not terribly long, challenging, or tiring and would be suitable for most abilities. BRC rents super fat powder skis, so there is no excuse to flounder in the deep snow on skinny carving skis from the east coast. Four people in our group rented fat skis for each day of skiing the entire trip. Once you go fat, there’s no going back. Leave the carvers at home. You need at least 100mm under foot and a big fat rockered shovel to float through the Kootenay powder with ease. The cat skiing was an epic experience for everyone in our group. As if that weren’t enough, it snowed another eight inches overnight yielding yet another stellar powder day at Red Mountain. Each day got better. Just when we thought it couldn’t get any better, the sun came out and we left Red Mountain and headed to Whitewater Ski. The town nearest to Red Mountain is Rossland. It is a quaint old mining town that was spruced up when they filmed the movie “Miracle on Ice.” Rossland posed as Lake Placid in that movie. The advertisement on the building remains as a relic from the movie. The economy in this part of BC is based primarily on mining and logging. As you drive towards Nelson, you pass huge lumber yards as well as a large smelter in Trail, which is the home of a very large mining operation. 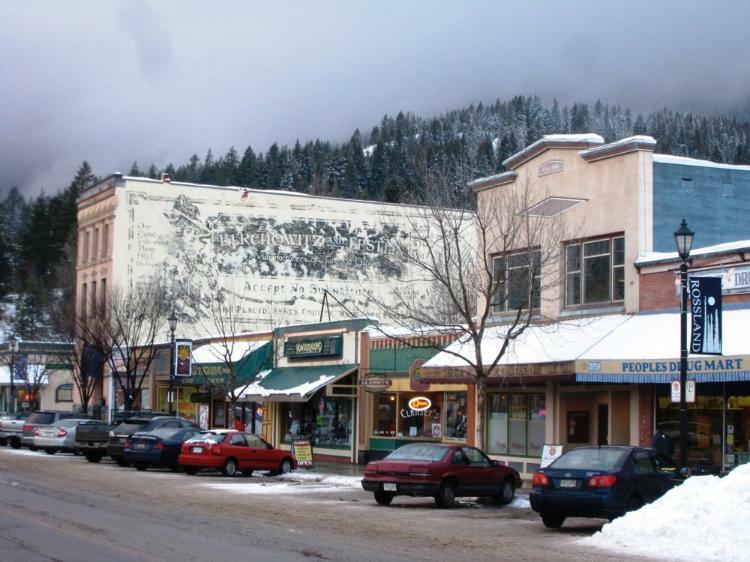 Nelson is a small city about an hour’s drive from Rossland that is approximately ten miles from the skiing. The Whitewater Winter Resort does not yet have lodging anywhere near the mountain, so skiers stay in Nelson. Nelson is a unique and eclectic town sitting on the edge of Kootenay Lake that has drawn people in from all over. We met people who have transplanted themselves to Nelson from all over Canada. We did not meet many Americans, though a good number came to Nelson in the late 60s evading the draft during the Vietnam War. We met one guy in his late 60s who was originally from New Jersey. He came to Nelson in his 20s and made it his home. We were envious, because it was quite clear that this place is very special. In Nelson, there are only two hotels that have hot tubs (Best Western and the Prestige Lakeside). There are two youth hostels and a couple of swank boutique hotels. We stayed at the Dancing Bear Inn, a hostel, which was clean and comfortable and a bargain at $20 per night and includes use of the kitchen. If you drive seven miles south out of Nelson, turn left on Whitewater Road, and drive to the end, you will have gone up 3,500 feet and into deep winter in the alpine zone. Often, it is snowing up at the mountain and either not precipitating or possibly raining in Nelson. Checking the weather forecast for Nelson will not give you any clear indication of what it is like at the ski resort. Whitewater left me speechless each day we skied there. The locals told me not to tell anyone, yet here I am writing about this special place, only because I know that most American skiers would more likely go to Whistler, Tahoe, Utah, or Colorado because they want luxury amenities like slopeside condos, spas, high-speed lifts, and long, wide manicured runs. While Whitewater has some nicely groomed runs, this is not why we were there. We were there to ski the natural snow in the trees. The snow was light and dry and bountiful. If it is snowing at Red, it is snowing twice as much at Whitewater. So while we were getting snow at Red, it was really piling up at Whitewater, and continued to do so each day we were there. We did get one sunny day and it had snowed six to eight inches the night before. It was like skiing in a fantasy dream where there was untracked snow every run. I would have had to pinch myself if my body wasn’t aching from skiing powder for six days in a row. Who needs cat or heli skiing when you can ski at Whitewater. With less than 2,000 skier visits on the busiest days on nearly 1,200 acres, there was hardly competition for the fresh snow, even on Saturday. This season, Whitewater added the Glory Ridge lift, accessing nearly 800 acres of terrain that was formerly lift-accessed sidecountry. You could ski the “Backside” before, but you would end up on the access road and hitch a ride back up to the lifts. One might think the lift would irk the locals who may have been fearful of having their stashes more easily accessed, but the fact is, everyone skied there anyway because it was well-known that getting there is very easy and worth the time and effort to hitch a ride back to the lift. Moreover, there is so much terrain that there is no shortage of stashes, and now everyone can get more runs in on “The Backside” without the hassle of shuttling people back to the lifts. The new lift was recycled from Vail. Whitewater has a green vibe with full-on recycling, including the recycling of the oil used to for the poutine fries as biodiesel in the snow cats. I even witnessed a young male snowboarder pick up an empty water bottle that was laying on the snow in front of the base lodge and heard him say “This is not cool at Whitewater” and took it inside to the recycling bin. The vibe is very green, hip, and aware amongst the people of Whitewater. There is an active backcountry culture at Whitewater. Those who prefer leg power have lots of access points from the resort boundaries. We saw no need to spend so much time climbing when there was so much lift-accessed powder to ski. All this powder will make a person hungry. The food at the base lodge is spectacular. There are even three cookbooks you can buy in the shop downstairs. 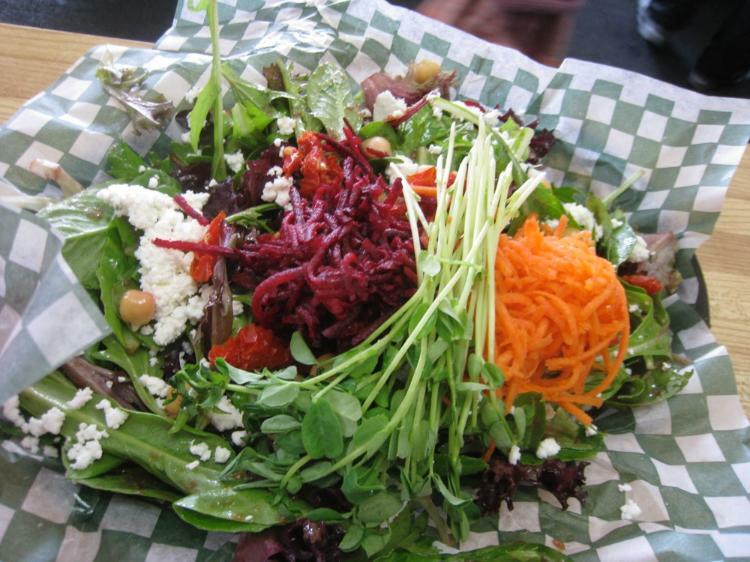 There is something for everyone, and everything is made fresh. I’ve probably shared too much about Whitewater. It was just too good to be true, so don’t even bother checking it out. It was all just a dream anyway. You’ve never heard of it. Powderqueen – you are so right on – it was a dream and a really good one at that! Thanks. Red and Whitewater are everything and more than what you said. I think if you had 2 weeks at each place you couldn’t ski everything there is at these 2 “small” BC areas. Besides the great skiing the vibe of the ski areas and towns was fantastic. Alot of nice people,most with skiing on their minds. A great combination! You have to love a ski area when it serves Poutine in its lodge.Its the fuel that keeps you going all afternoon on a powder day! What a great crew to travel with. Everyone got along great which was especially important at the Dancing Bear as we were all in one small room with 3 bunkbeds. I hope the crew can do another trip next winter! Amazing story, photos and the video of the silver skiers was so empowering! Hope to ski with you soon Sharon! Mark, I hope we can all go back to BC next winter together! Maybe more people will come with us, enough to fill a snowcat. The whole adventure seems very real and down to earth, yet still fantastic at the same time. Really well done feature on what looks like an amazing powder experience. Red Mountain? Whitewater? Never heard of them! Great read and deserves publishing if it had been real. Keep us in the loop on next years plans and we’ll see you on the mountain! Thanks for the insight on areas less traveled. Sounds like premium snow cat conditions, but on lift served terrain. Can’t beat that. Chuckled over the hot tub mentions. Got to admit I also strongly favor those as one of my few ski trip luxury interests. My only reservations about that part of BC would be the cost of airfares and odds of low visibility weather. It’s a great feeling to ski those kind of conditions on a trip that was booked several months in advance. I learned that late Feb and early March are ideal times to go to BC for good snow and you wouldn’t risk much booking a trip there during this time. Red is lower in elevation so that is the risky factor, but you can count on Whitewater for good snow. I recommend going to Red first. It is definitely worthwhile to visit both places during a vacation. But if the weather brings mixed precip to Red, you’ll be sure to get powder at Whitewater the next day. I have been to both red and whitewater twice in the last couple of years. i found reliable snow and plenty of it both times. next time you’re in whitewater check out a guide service known as secret stash, they will show you places you would probably not find. some hiking is involved. 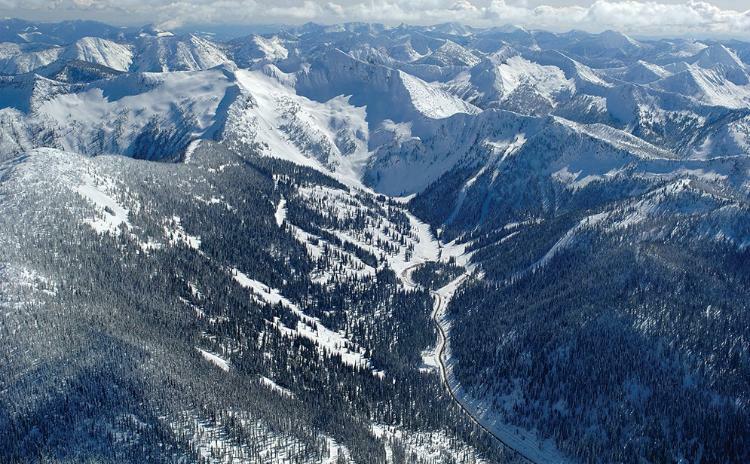 when your done there, pack the car and head to fernie. now you got a real b.c. ski trip. Although we also skied Castle Mtn. Alberta, Fernie, Revelstoke, and Kicking Horse, the skiing and SNOW at both Red Mountain and Whitewater were the highlight of the trip. You haven’t lived until you’ve emptied your RV sewage holding tank in the middle of winter.